At a time when safe drinking water was less readily available, small-scale purification equipment was much in demand, particularly in the less developed parts of the world. 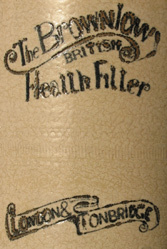 Slack and Brownlow Ltd made thousands of water filters like this one at their Town Mills factory in Tonbridge, marketing them as ‘a safeguard against cholera, typhoid and kindred water borne diseases’. The filters were assembled from ceramic parts fired in large bottle kilns on the site. In use, the lid was removed and impure water poured into the upper container, from which it slowly filtered its way down, passing through the pores of a candle-shaped stick of a material known as Kieselguhr, consisting of the hard shells of minute aquatic animals. Pure water collected in the lower chamber and could be drawn off through the tap. The example shown here is 0.45 m tall, and probably dates from about 1930, but water filters operating on the same principle are still available today. Slack and Brownlow began making water filters in Manchester in the mid-19th century and moved south to Tonbridge in 1921 to be nearer the docks, since much of their output was exported to hot countries. Along with a sister company, British Berkefeld Filters, they took over the former premises of the failed car manufacturing venture, Storey Motors, situated where B&Q and Halford’s now stand.